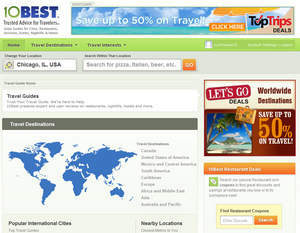 SAN FRANCISCO, CA--(Marketwire - January 25, 2011) - Following its recent acquisition of travel Q & A site Localyte.com, global travel content publisher NileGuide.com today announced the acquisition of travel recommendation site 10Best.com for an undisclosed amount. The 10best.com acquisition from Enveritas Group, Inc. solidifies NileGuide as the largest independent travel content network with a combined reach of over three million visitors per month. "We're committed to creating high-quality original travel content that marries local knowledge with expert editorial, and this acquisition helps us accelerate that strategy," said NileGuide CEO Josh Steinitz. 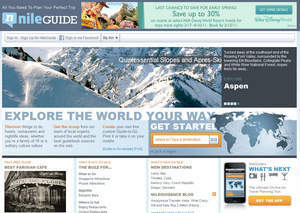 NileGuide has a proprietary global network of several hundred contributing editors, known as NileGuide Local Experts, who live in top travel destinations around the world. These Local Experts provide free itineraries and unique, "for-travelers-by-locals" insight into topics ranging from the top kid-friendly things to do in London to the best hotels in New York City. Additionally, through the Localyte acquisition, NileGuide.com provides visitors with the unique ability to receive answers to their travel questions from locals living in over 75,000 destinations around the world. 10Best.com, known for its strengths in restaurant and attraction recommendations, features additional original content on the best hotels and places to shop in the world's top cities. For example, the site provides users with travel advice on topics ranging from the best seafood restaurants in New Orleans to the top attractions in Chicago. 10Best founder Brice Bay of Enveritas Group adds, "We're excited to bring 10Best to a company that's growing through a combination of top-notch original content and providing travelers with Q & A access to a massive community of people living in top destinations around the world. NileGuide is pushing the envelope in original travel content, and we're excited to contribute to their growth." NileGuide.com offers unique, "by-locals-for-travelers" recommendations and free itineraries covering what to see and do, as well as where to stay and eat, in thousands of popular travel destinations. These recommendations and original itineraries are created by over 150 NileGuide editors, or "Local Experts," spanning the globe. NileGuide.com further provides travelers with the ability to ask questions and get answers from over 75,000 locals around the world. For more information, visit NileGuide's Press Room.